And if that wasn’t bad enough, I called a bunch of vitamin companies to inquire about their ingredients, and after listening to elevator music (for what seemed like FOREVER), none of the companies could confirm that their products were gluten-free! Many of them said that there could be gluten cross-contamination from other products that they manufactured as well. Uggh. I hung up the phone many, many times feeling frustrated… and totally confused! Well, when my husband and I got pregnant (yay! I am currently 24 weeks pregnant with my first baby- a little boy! ), I was even more concerned about getting gluten-free vitamins. Every pregnancy book or magazine you read, it states in bold print: YOU NEED TO TAKE PRENATAL VITAMINS. Besides getting the nutrients you need to make a baby, getting at least 40 mg of Folic Acid is apparently absolutely critical to help avoid super-scary baby-health problems! I felt like I was going to have a panic attack as prenatal vitamins were impossible to come by too! I even ask my Gynecologist if she had any gluten-free prenatal vitamins and even she wasn’t sure that any they had were GF! Yikes! So, imagine my RELIEF when I came across a brand of gluten-free vitamins! And not your ordinary gluten-free variety… GUMMY BEAR GLUTEN-FREE VITAMINS!!! WARNING: Lil’ Critters Gummy Bear Vitamins are sooo unbelievably good, you’ll want to eat them like, well, REAL gummy bear candies! These gummy-vitamins are super soft and chewy, and REALLY, taste just like candy. They’re totally fabulous! And guess what? 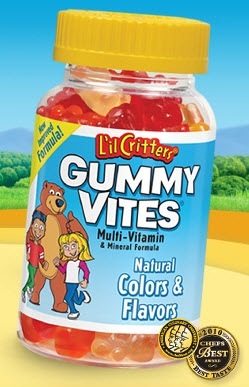 Gummy Vites have no wheat, gluten, milk, eggs, peanuts, tree nuts or soy. They also have no artificial colors, flavors or preservatives. …SWEET! I asked my OBGYN if I could take these gluten-free vitamins for my prenatal vitamins, and she said yes! I just take two a day, and I’m good to go! I absolutely love these vitamins and think their perfect for any kid or adult that doesn’t want vitamin-time to be torturous! Life should always be delicious- even when you’re being healthy!